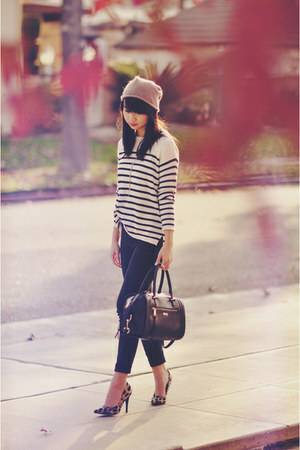 Ivory H&M Sweaters first appeared on Chictopia's streetstyle gallery in Fall 2010 seen on San Diego blogger irisanddaniel of wehavenostyle.com. He styled his ivory sweater with a camel liz claiborne coat, ruby red Thrift Store skirt, and black H&M sweater vest. Since then, Ivory H&M Sweaters have grown in popularity as bloggers from Los Angeles, San Francisco, and New York have discovered them. Ivory H&M Sweaters are generally seen in casual, chic, and classic style. Popular types of Ivory H&M Sweaters are chunky knit, knitted, turtleneck, striped, and knit. There are currently 89 streetstyle photos of bloggers wearing Ivory H&M Sweaters. 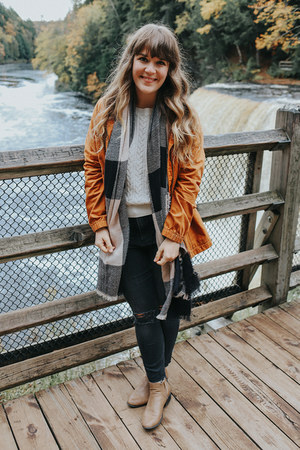 Most recently, blogger selectivepotential of selectivepotential.com styled her ivory H&M sweater with a tawny duo boots boots, olive green Levi's jacket, and black white plum leggings.